Track your productivity on-the-go, wherever you are. 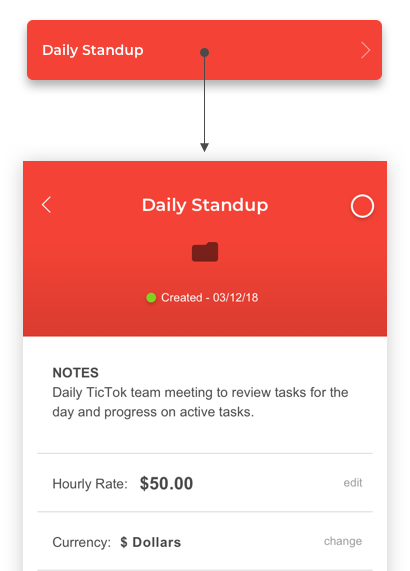 The TicTok app goes wherever you go allowing you to quickly and easily log or record tasks throughout your day with no disruption to your flow. We've turned time tracking on its head. Rather than looking at what you plan to do, we look at what you've just done. 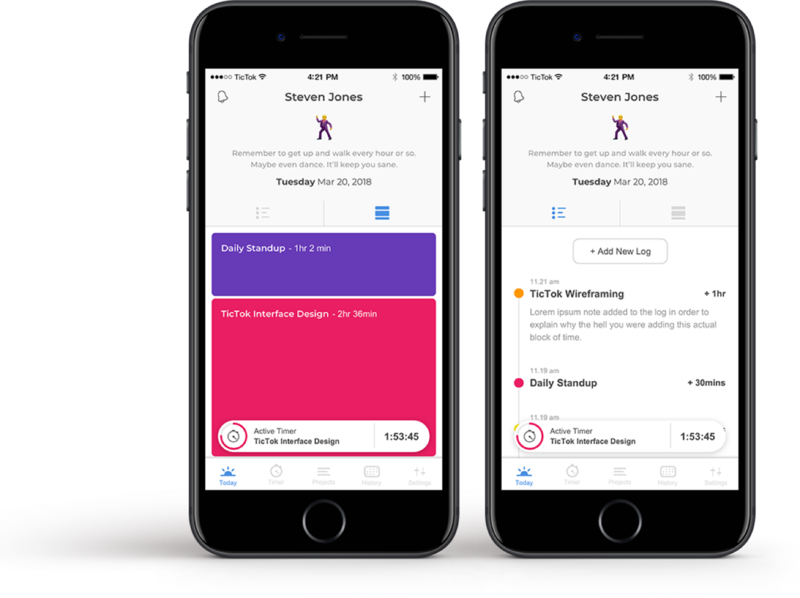 The Timeblocks view shows you all the activity for a single project presented as an overall block of time within your day. This allows you to see how your activities weighed up against each other when it comes to attention and effort. Your Timeline view shows you an over-time progression to see when you moved from one activity to another in the course of a day. Create your projects your way. Make any activity you want to track a project within your TicTok app. Customize each project to meet your needs. Everything from name and color, to hourly rates and preferred currency, is in your control. Once a project is completed simply archive it to remove it from view while still keeping your project data for reference. Your day and your projects in your control. 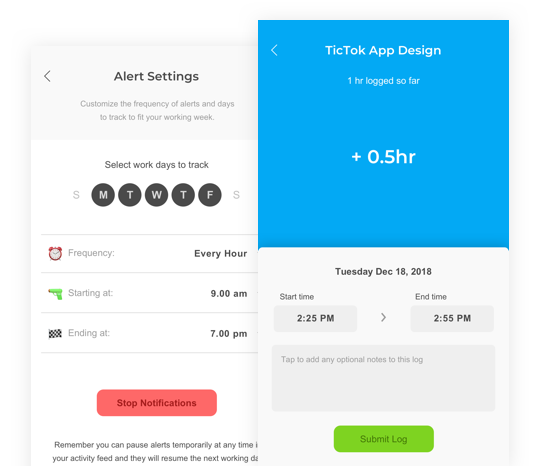 Set TicTok to work on your schedule with controls for the days, and times within a day, it will be active and the frequency of alerts. Get more detailed with projects by adding optional notes and editing times to match exactly when your task took place. Review your activity whenever you need it. No need to trawl back through emails or calendars to try and see what you were doing on a particular day. These are often not reflective of how the day progressed anyway. With TicTok you can dig into a history of your activity to easily, and more accurately, trackback day-by-day and review where you spent your time. 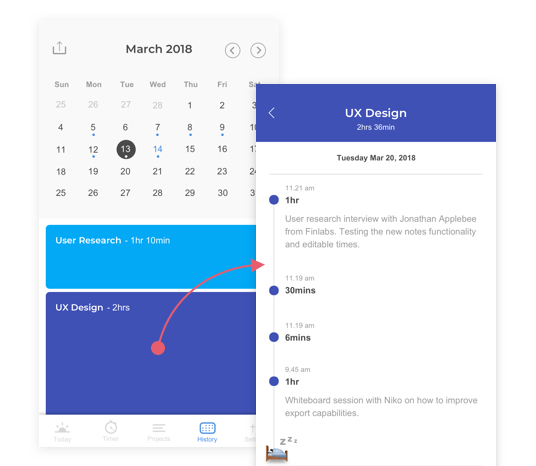 Export any date range from your history, any project, or any month within a project to take your data into any application you choose outside of TicTok. TicTok takes your logged information and presents it back to you in cumulative statistics and a visual chart where you can easily see where you’re over, or under, performing and how much your time is worth. Get invited to projects by any company on the TicTok Business Manager platform to work with that team to keep your projects moving forward together.